This ring features a 0.31 carat Gemesis Lab Created diamond, Intense Vivid Yellow color, VS2 clarity. 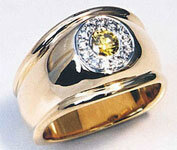 The yellow diamond is encircled by twelve 0.01 carat pave` set white brilliant cut natural diamonds. This solid ring in 18 Karat yellow and white gold is stirrup shaped for a comfortable fit. It weighs 18.0 grams.